Dr. Rhine was born near Lexington, Holmes County, in Mississippi April 2, 1876, the son of John Thomas and Susan Elizabeth Weeks Rhine. He was the second child in the family with one sister older and two younger. His great grandfather had migrated from Germany to North Carolina in 1765. The family moved from Mississippi to Rison, Arkansas in 1881 when Dr. Rhine was 5 years old. He received his early education in the country schools of Cleveland County and graduated in the first graduating class in Fordyce, Arkansas. Later he graduated from Clary Training School and then continued his education at the old Memphis Hospital Medical School. 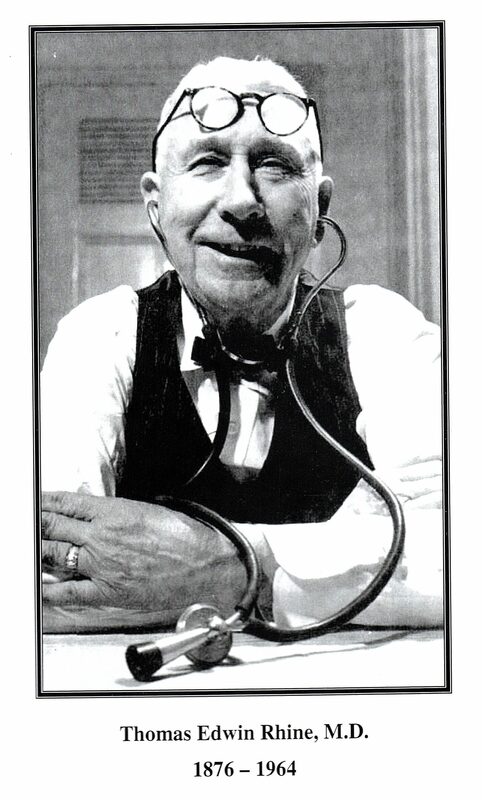 Dr. Rhine practiced medicine in Thornton Arkansas in Ouachita County from1899 to 1964, a total of 65 years. He died at the age of 86 on September 23, 1964. During WWI Dr. Rhine served as a 2ndLieutenant in the U. S. Army Medical Corp. Following the war he married Nanita Raines in September of 1925 in Little Rock, Arkansas. The couple had three children, Virginia Elizabeth, Susan Ethel and Patricia Edwina. After his first year of practice he was named head surgeon and physician for Stout Lumber Company and remained with them until it closed in 1927. Throughout this time he continued in his private practice. In all his years in practice he delivered more than 7000 babies; in some families he cared for 6 generations; diagnosed the first case of tularemia in Arkansas; assisted in founding the Dallas County Hospital in Fordyce, and was on its staff until his death; was the Calhoun County Health Officer for many years; helped establish the American Legion in Ouachita County; served on the Thornton School Board for several years and thereafter a new high school was dedicated to him. He was honored several times: named Doctor of the Year in Ouachita County and the Physician of the Year in Arkansas in 1948, and was runner up of the American Medical Society’s General Practitioner of the Year in 1950. He was an avid hunter and was named Fox Hunter of the Year in 1956. To reach his patients, he has used a horse, a bicycle, his first Model T bought in 1913, log trains, a freight train cabooses, rowboats, even his own legs to get to his patients. At the age of 88 he was still making house calls within a 20-mile radius, though he said he was trying to cut back on the midnight to daylight calls. Dr. Rhine was a beloved old country doctor, dedicated to all who came to him. He spanned the period in history where beginning scientific and high technology were little known and yet as an avid reader kept up with the coming changes that could best served his patients.